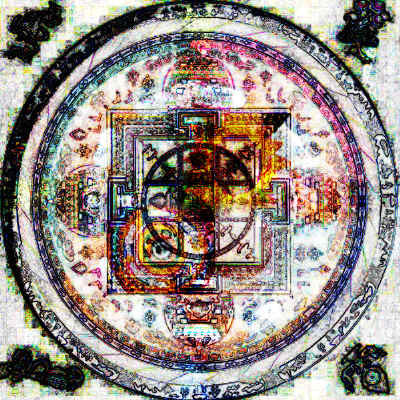 Mandalas have been employed by a variety of spiritual traditions to awaken the kernel of sanctity that lies dormant within all of the manifested universe. These Sonic Mandalas continue that tradition and may be used to focus attention and exercise pure consciousness in a trance state. They are also beautiful and enjoyable as pure musical experiences. 16 tracks ring in at just under one hour. Each track expresses a unique space moving from expansive bright moods to dark ambient spaces and everything in between. Ambient electronic sounds meet with blip and body moving beats to create an album that spans from the heavens to the earth and back. This music can be used for meditation, deep listening, conscious movement, or sacred dance. Its the perfect CD to make any space more alive and conducive to the flow of creative energies. From the dark striplings of sound and amorphic drum sentiments of 'Ouroboroso,' 'Annulus' or even 'Crateraae' to the Photek or D'iberville-like D'n'B works of 'Clypei,' 'Globulus,' 'Tympani' or 'Aequatoris' to the airy and quasi-melodic 'Circulus,' 'Lamnae' or 'Aureola' and whatever lies beyond, JC has created a constant flow of amoebic rhythms, stirring rushes, low frequency baths and industrial ambience over the course of 16 short but stunning tracks. What first appears to lay the foundation of a typical Cold Meat style recording suddenly surprises with electronically infused drum patterns: simple and somewhat atypical at times, yet miraculously fitting; oppressing bass cruches and unexpected melodic sequences (think Urmur Bile Trax, yet unfettered and relaxed), giving the whole disc a rather refreshing direction as opposed to sputtering about on the same old same-old of most dark ambient/electronic works. JC has beautifully crafted a journey of sound that doesn't disappoint, working to drag you through deep space or the dark recesses of the mind and never faltering on prolonged obsessions with persistent drones or half-assed rhythms. Overall, this is one of those rare instances where I feel the work is neither over- nor underdone and delivers exactly what it set out to do, from beginning to end.